The long, over-water patrols routinely performed by USN patrol squadrons as well as those by their IJN counterparts were, as the saying goes, “99% boredom, and 1% sheer terror:. That last 1% is what we see here. On 2 July, 1944, VP-115 with Plane Commander Lt. Stoughton Atwood Flying PB4Y-1 Bu #32274, with no markings other than the Bu. 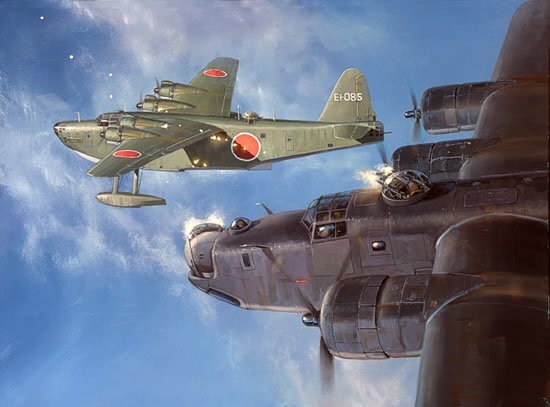 # on the tail, searched a sector extending from Wakde Island toward Mindanao, PT, …when an IJN H8K1 “Emily” intersected their course at an altitude 1,000 feet lower, when first spotted by Atwood’s eagle-eyed crew. The Japanese remained unaware of the Liberator maneuvering into attack position, until the moment pictured. Atwood’s copilot recorded the violent event, ending in the destruction of the Emily, from the right seat taking a series of 15 photos with the ship’s K-12 camera. As an interesting aside, Lt. Atwood had a premonition before the mission that they would encounter an Emily and he asked his highly skeptical crew to prepare for this event, which the did. Also, contrary to some narrative accounts of the event. Crew 12’s normally assigned aircraft; the “Briny Marlin” was not flown on the 2 July mission having been destroyed days earlier during a Japanese bomb-raid onn Wakde.